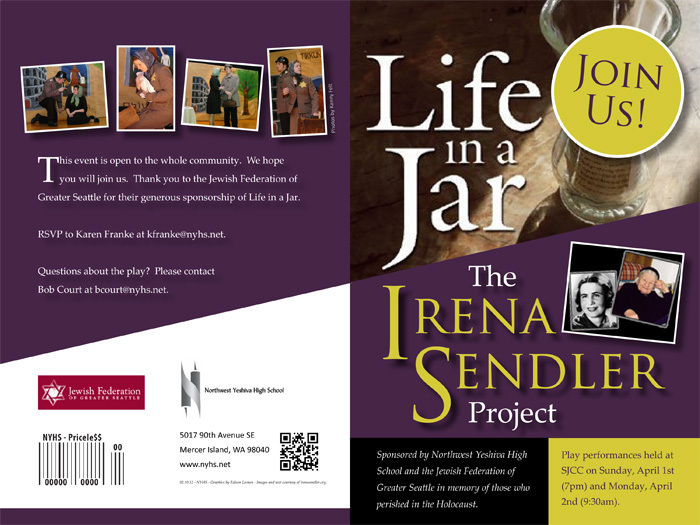 The Life in a Jar play and presentation is ideal for conferences and conventions, especially educational,social work and religious groups. Temples, churches and groups of all kinds have been inspired with the Life in a Jar presentation. A powerful presentation for all audiences. 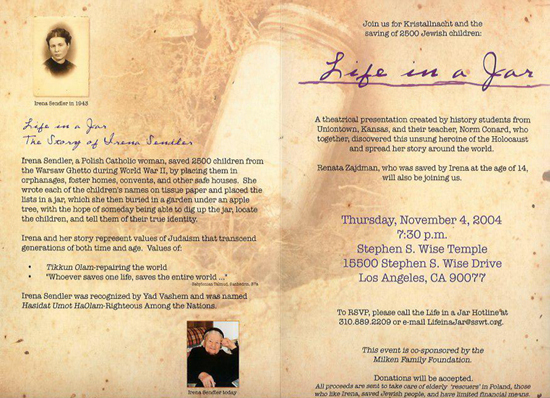 A dynamic program touching the Holocaust, ethics, education, respect and unsung heroes. 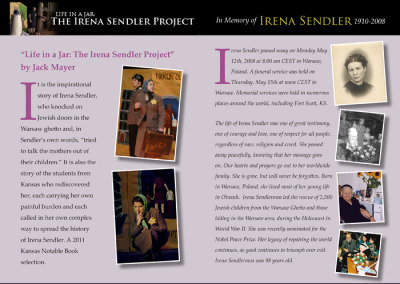 A program which brings together a great educational project and a courageous woman. A presentation of hope, not despair. The following are needs for Life in a Jar presentations. If you are having difficulties with any of these, please contact us as soon as possible. We are flexible on some of the below requirements. As an alternative to the full presentation, individuals also present at conferences across the country, occasionally with a student or two. The needs or costs are much less, with air for one, lodging and land transportation. Individual speakers generally address adult audiences. The program needs to be a minimum of one hour and 10 minutes. (It generally lasts about 80 minutes.) The presentation can be made in exactly one hour, if necessary. A minimum audience of 150 people. We will use what is available for venues. No disruptions during the presentation, such as setting up a dining area for a following luncheon. The nature of this program can be very intimate. If the sound and light possibilities are right, then a large audience can be accommodated. Performances have been done for audiences over 2000. We can present more than once a day, especially on distance trips. The stage area needs to be at least 15 x 20 ft.
A local newspaper story; put us in contact with a reporter. We have examples from USAToday and the Kansas City Star. Hundreds of newspaper stories, radio and television stories have been done on the project. We will cooperate with all media and love to do interviews. Have local radio stations and television stations cover the event and do pre-stories. Note: high resolutions images for advertising are available by contacting Mr. Conard. We present to a variety of audiences and in a variety of locations. We enjoy family audiences in an evening setting, most of all. The students miss less school with evening presentations, but we also present in schools. At least three microphones (directional microphones are best-again, if possible) are needed for the stage. Lapel microphones cannot be used. We show a DVD in our program and will need as large a screen as possible, as well as a projection unit. We will need to visit on lights and sound. A podium is needed on stage with a microphone. An extension cord from the back of the stage. A small microphone is needed in the back of the stage or the ability to play music from an iPhone 6 through the sound system. We need a chair, hopefully old, wood and not in good condition. We also need a 6 foot table near the entrance to the presentation room to put the “jar” and cards on. Meals provided during setup. Local favorites are welcome. Bottles of water for cast and crew before, during and after presentation. Air fare for six, arranged by the venue and Life in a Jar. Land transportation at the venue. A Toyota Siena holds six people and ten suit cases, which includes our six suitcases of props. Please include some gasoline for the auto at the venue. Prop delivery fees through UPS. Lodging: Three rooms in a hotel each night we are there. Meals on the trip. We would also appreciate some snacks while setting up the play. This comes to about $15 per person, or $90 per day. We must close the educational office for each week day. A sub costs us $80 per week day, so add this amount for each week day we miss. We also appreciate a donation to our non-profit. The cost for a two day trip, including flying, does not usually exceed $3,900. Additionally a three day trip, including flying, does not usually exceed $4,700. Keep in mind, if we decide to drive, the cost diminishes considerably, but we try to keep the driving within a 200 mile radius. Flyers posted in the community. See below for some samples. Dear All… I can’t begin to tell you how incredible it was meeting all of you and getting to know you. Your sensitivity, compassion, and warmth is a real inspiration. Your thirst for knowledge and your ability to stand in another pair of shoes is rare and a wonderful example to all those who hear your story. Keep sharing with the world around you. You have no idea how many individuals you have affected and in so doing have changed the world. You all have made a difference! And you continue to make this world a better place! MAZEL TOV, Congratulations for your beautiful work. 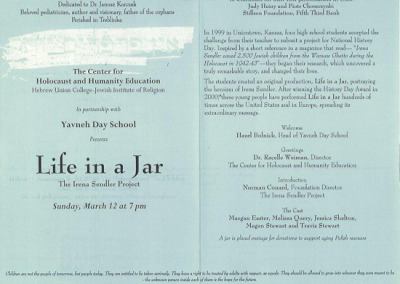 I’ve been reading all of the wonderful responses to the recent performances of “Life in a Jar.” It is astonishing to me how the telling of this story works its magic everywhere you go. As the original players now move on with their lives some thought needs to be given to how they might maintain that genuine, personal touch to the project as it transitions to the next generation of performers. It seems as if that might already underway; I hope so because it is profoundly important. 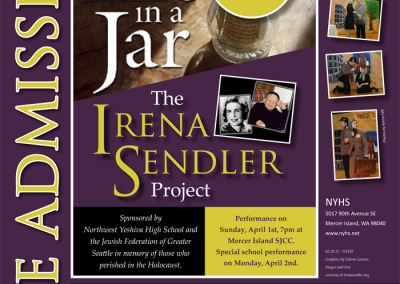 I believe it was the personal connection that drew the audience into the performance and discussion, and then drove the message of “Life In A Jar” deeper into everyone’s awareness that night. Audience members were engaged with the performers. After the performance in New York, I went home on a cloud. The reception at the Polish Consulate was something very special to those who came. I walked among the crowd and listened to such beautiful, positive remarks and all said “the children will lead ” into the future. The Kansas students are teaching us to “love thy neighbor” and “do unto others as you would want them to do unto you.” It is really so simple that grown ups forget this simple rule. As I said already….”the children will lead us”…but we must listen carefully to their message. 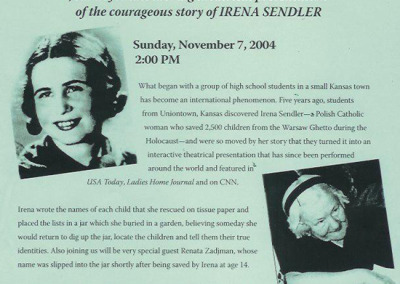 I feel you are all heroes because of the time and energy you have committed and continue to commit to the Irena Sendler story. You have shown your play to over 200 groups throughout the United States and in Poland and have received rave reviews from every performance. 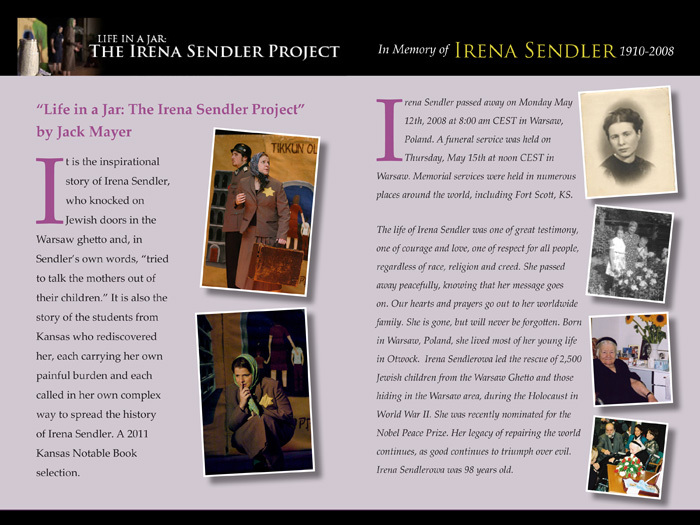 Your commitment to this project has raised Irena and her story to a new level of recognition in her city of Warsaw, her country of Poland as well as throughout the world. 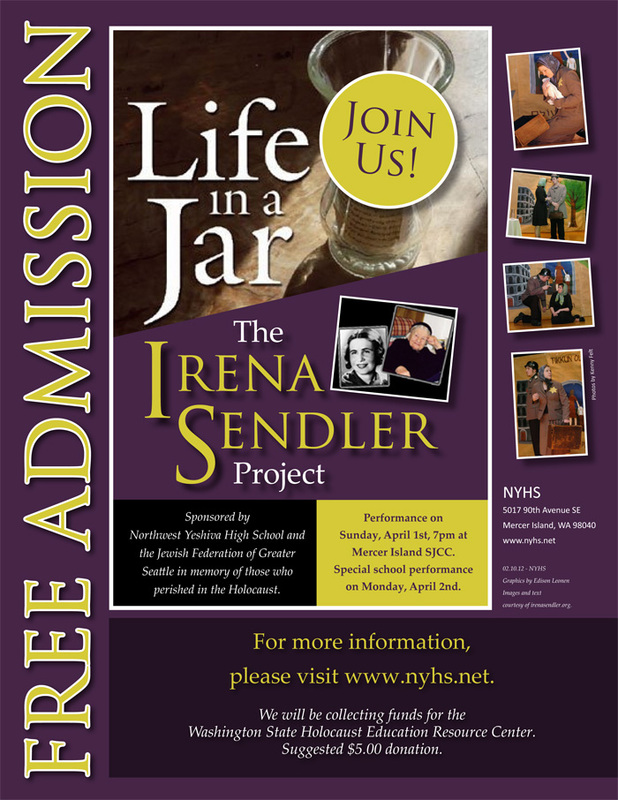 We have learned about your last local performance of “Life in a Jar”. We are sure that for all of you this has been a lifetime adventure. For us it certainly has, because we owe to it our wonderful friendship. We believe that those who have seen your play will never forget its wonderful message and the enthusiasm with which you tell the world that, amidst so much evil, there is also good and that this good, which you portray so marvellously, makes it worthwhile to live and help each other. We enjoy and admire your success, and hope that life will continue to be always so happy and rewarding for all of you. December 19, 2004 -Dear Mr. Conard, My name is Jill Spain. 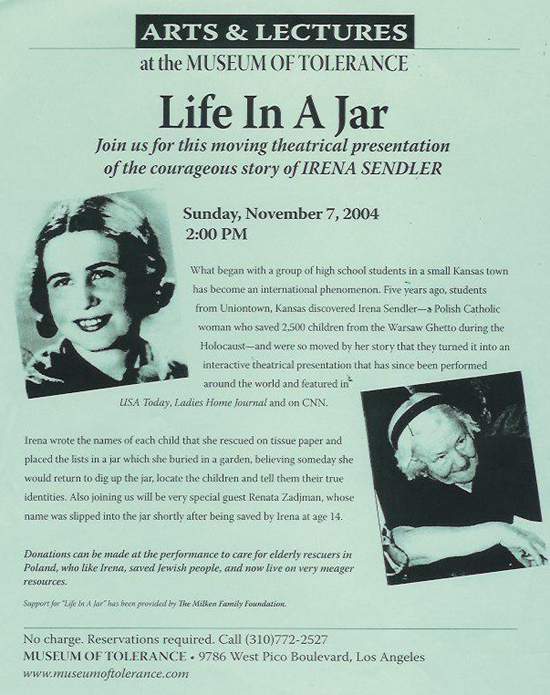 I am a middle school teacher in NJ and I saw you speak at the Pennsylvania/ New Jersey Holocaust conference. First of all, I think you and your students have done an amazing thing. After listening to you I felt inspired and compelled to come back to work and try harder to make a difference in this world. It is often frustrating because I often feel that I need to do more, yet I don’t know exactly where to begin. You helped me find the answer, I just have to start right here. I have asked my principal for permission to paint your class motto on the wall outside of my classroom to remind me and my students everyday that one person CAN make a difference. Thank you for reminding me of that. Thank you again for your time and being a constant reminder of the power ofa small but dedicated group of people. You are my inspiration!! 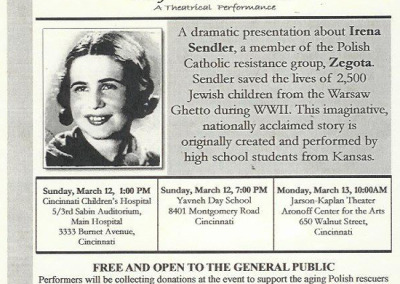 Dear Students; I saw your play at the Koscuiszko Foundation in New York City and it brought tears to my eyes. It was a pleasure to see young adults in this 21st Century showing such compassion and caring for other human beings. We are all on the earth for a reason and each of us has a task to do and complete. You all have been given an enormous undertaking which has been reaching various parts of the globe. May you complete it with God’s blessings. You and your parents should be congratulated for all the good you are bringing to all the people you come in contact with on this project. 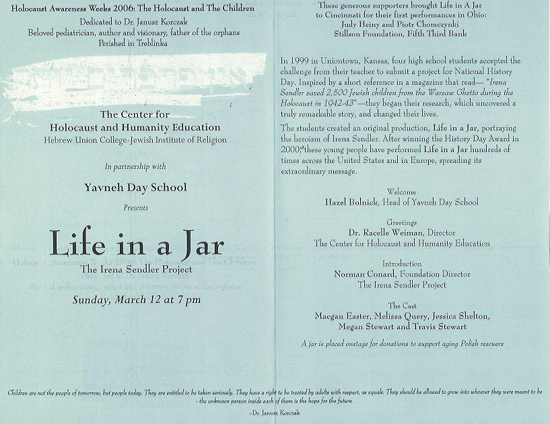 January 27, 2005 – What an outstanding presentation you and your group of students provided for our audience. 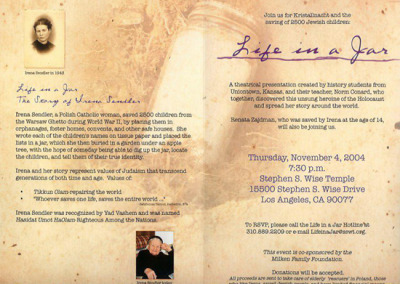 I’ve not seen Eva Unterman (child survivor from the Lodz Ghetto) moved so in a very long time. The most painful image for her was watching the mother telling her children good-bye. Thank you for the work you do in promoting respect and acceptance. 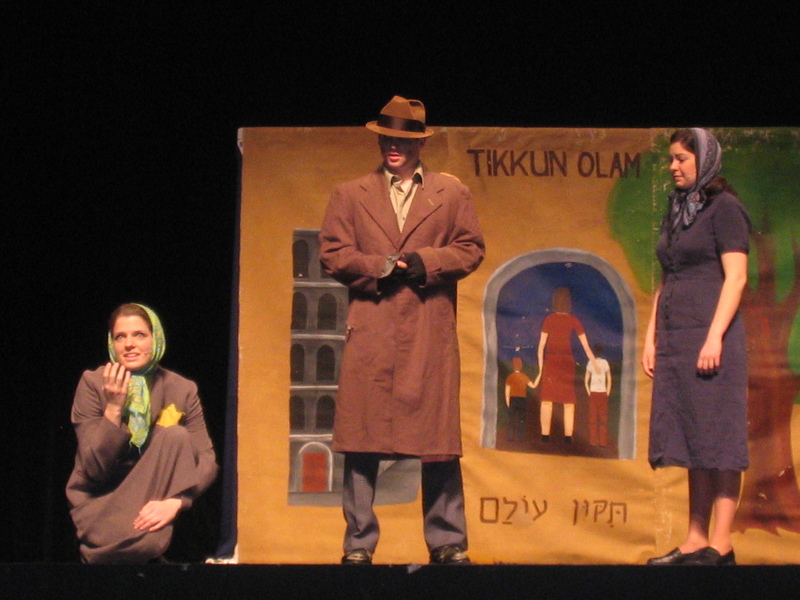 December 10, 2004 “to the wonderful cast of “Life in a Jar,” I am writing to you, after seeing your performance at the West Valley Jewish Community Center at Milken in West Hills, CA. I wanted to commend all of your performances as well as efforts. 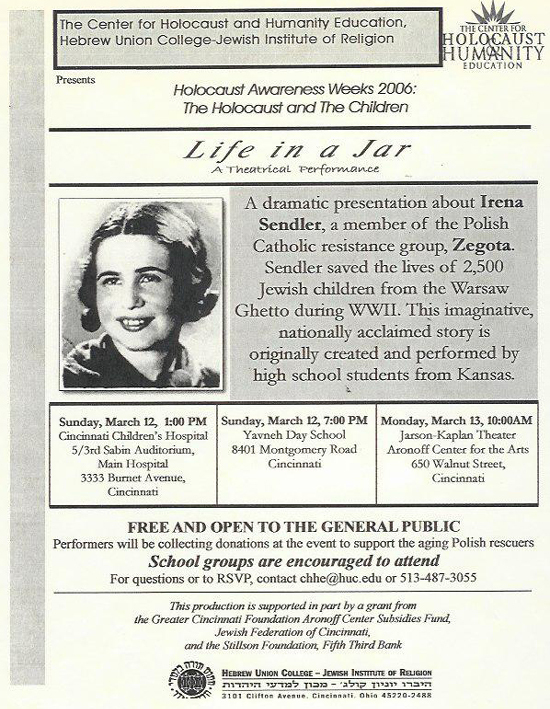 I have experienced many Holocaust stories, including the one my grandmother has decided to share with me. Knowing first hand what it feels like to be a target of such horrible anti-Semitism, I want to say thank you. Your performance was not only extraordinary, it was awe-inspiring as well. It amazes me to know that people like you exist in this world because it is easy to get lost in the animosity of today.